Thanks to Dr. Mohammed Sami Saeed, University of Mosul (Iraq) for contributing this case. To contribute a Case of the Week, follow the guidelines on our Case of the Week page. (1) We are making some minor changes to our Home Page. The Reviewer Resources page has been moved from the Home Page to a link from the Reviewers page. (2) Good news on the chronic problem of Nature Publishing blocking our website, including the great images from Modern Pathology. First, our clever staff have found a way to avoid the block that is legal and ethical, that will be implemented as we update each of our 6700 topics over the next 1-2 years. Until we get this completed, you can copy and paste the image web address into a new window or tab and press enter. Second, after one year, Nature has finally admitted that they are, in fact, blocking our website, and it is not just our imagination. They are blocking us because we were driving too much traffic to their websites. I honestly don't know if we can convince them that this is actually a good thing, but we will try. In any event, the problem will lessen as we redo the links over time. (3) We have added new Board Review questions, courtesy of BoardVitals, which are accessible via our CME page. (4) New stains recently added to the Stains and Molecular Markers chapter include Tissue of origin / unknown primary, MLL / ALL1, NEK2, Olig2, PDS5B, Stat3 and Twist1. (5) We posted a new section, Personnel Management, in our Laboratory Administration chapter, written by Richard Horowitz, M.D. I personally found these topics helpful in managing our business, and recommend them to everyone involved in management in some way. 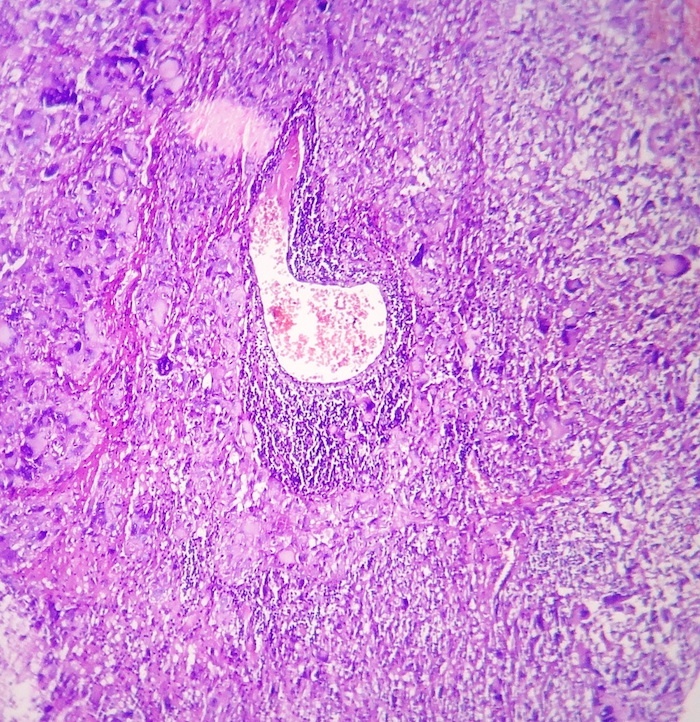 A 17 year old boy presented with a solid and cystic frontal brain mass, which was biopsied. 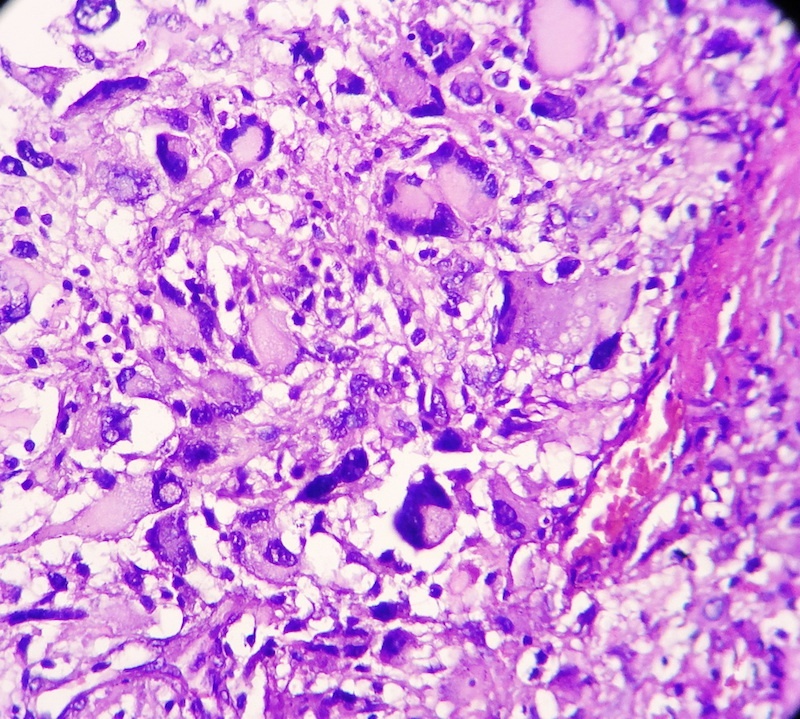 The microscopic images show an infiltrative cellular astrocytic tumor with prominent pleomorphic, hyperchromatic, multinucleated malignant giant and bizarre cells associated with frequent mitoses, many of which are atypical, in a fibrillary background. 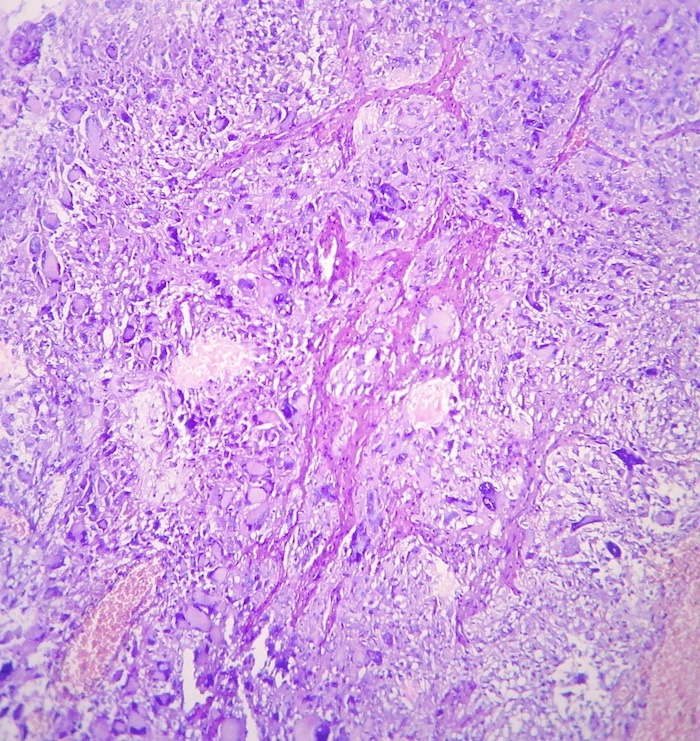 Microvascular endothelial proliferation and large foci of palisading tumor necrosis are easily identified. 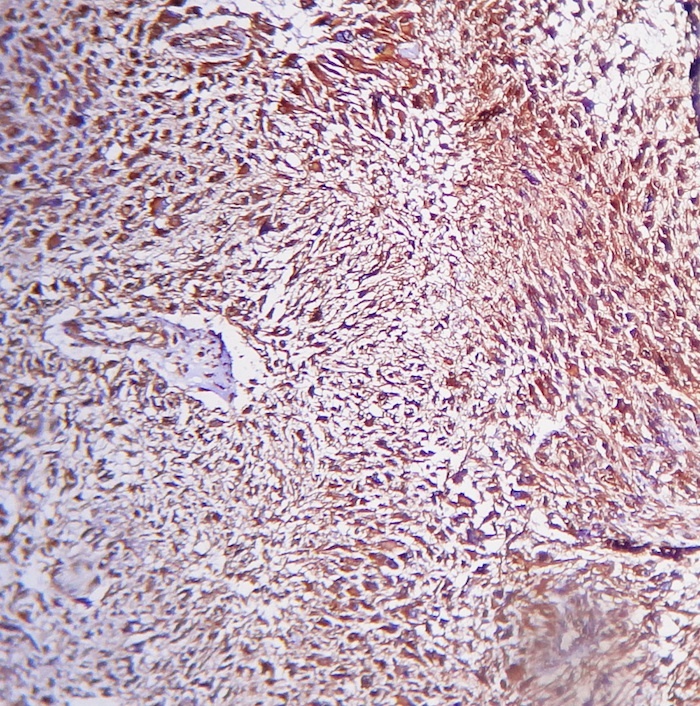 The tumor cells are immunoreactive for GFAP. 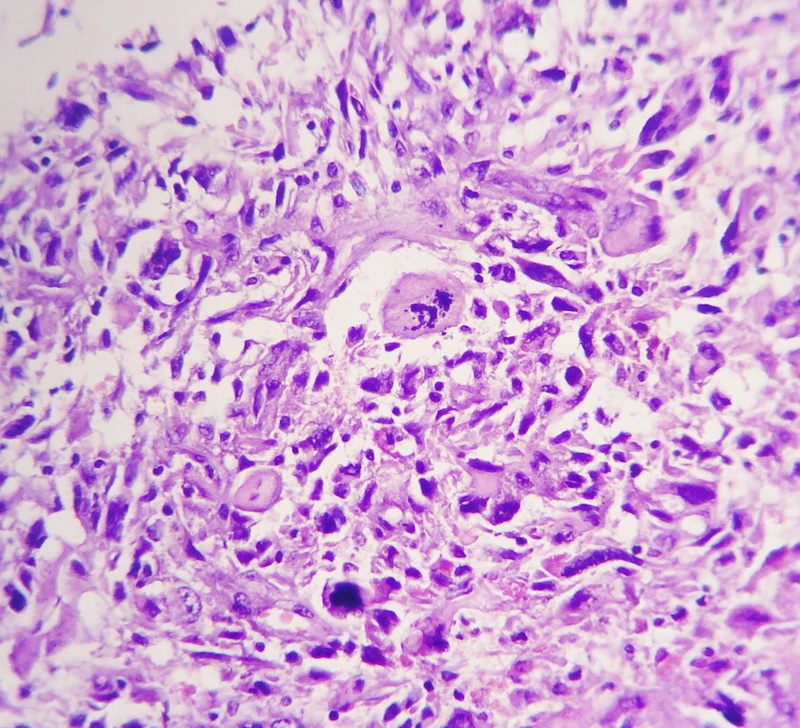 Giant cell glioblastoma is an relatively uncommon subtype of glioblastoma multiforme (5% of cases), that typically affects somewhat younger patients than the classic type (mean 51 years versus 62 years), and has a better prognosis. Grossly, there is a circumscribed, firm, often subcortical mass. 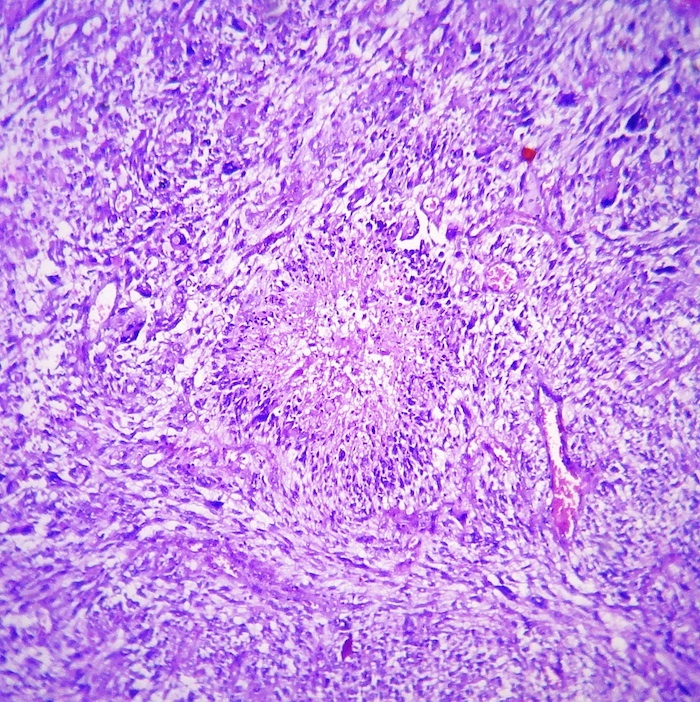 Microscopically, as in this case, there are abundant, bizarre-appearing tumor giant cells, many multinucleated. 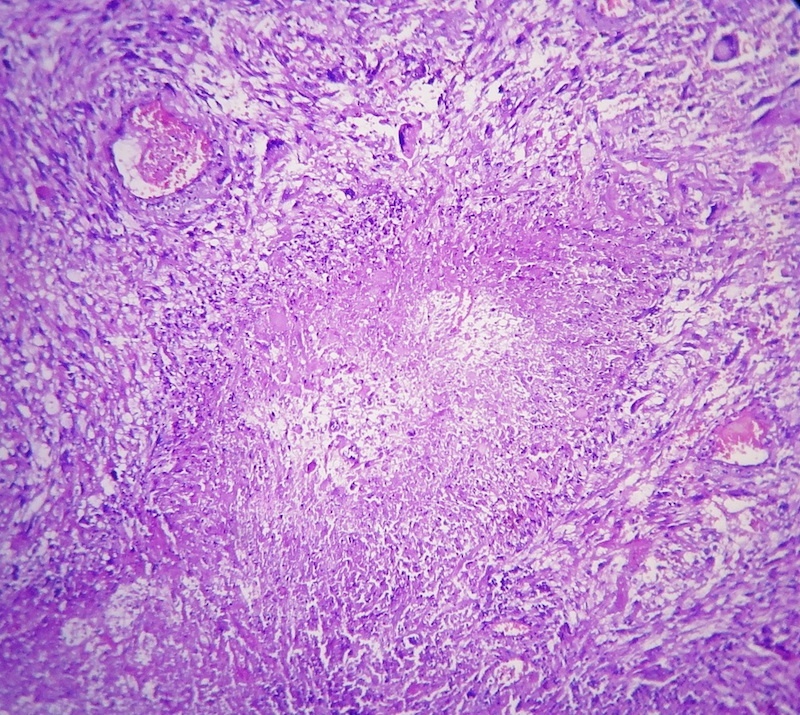 There are also smaller fusiform cells, extensive necrosis, brisk mitotic activity and occasional perivascular lymphocyte cuffing. p53 mutations are identified in 75-90% and EGFR amplification is rare (Cancer Genet Cytogenet 2007;175:26). The differential diagnosis includes pleomorphic astrocytoma, which also has pleomorphic cells and perivascular lymphocytic cuffing. 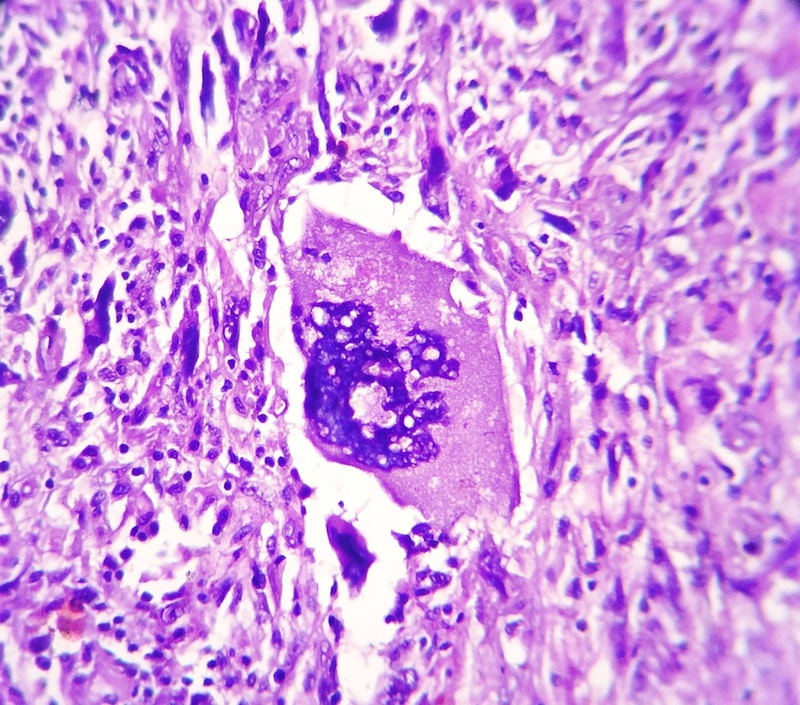 However, typically there is no necrosis and no mitotic activity, except in tumors with components of anaplastic features. Recommended treatment is complete resection with possible adjuvant radiotherapy (Neuro Oncol 2009;11:833).